The Dingos overcame a slow start to defeat the Central Blues by 20 points on Saturday, securing a finals berth in the process. In a gutsy comeback win, the Dingos had to recover from a goalless first quarter that saw them give up four goals while also losing a key player to a red card, meaning that they were forced to play short for the final three quarters. Despite the slow start on the scoreboard, the consensus at quarter time was that the team wasn't playing badly, and as soon as bounces started to go the right way the match would even itself up. The Dingos burst out of the blocks in the second quarter, kicking eight goals to one to open up a 21-point half-time lead. In the club's best twenty minutes of footy in 2016, the midfield of Justin Davis, James Duggan and Michael Ladd dominated the clearances thanks largely to the precise ruck work of Tom Bell. Second-gamer Eoghan Bergin chipped in with his first goal in Aussie rules, while also working hard around the ground and taking plenty of marks. A three goal to one third quarter, combined with a quick start to the fourth saw the Blues get to within two points of the Dingos in what was an exciting encounter. It was a clutch goal to Tom Bell that helped give the red and black some breathing room, before rookie Thomas Santibañez-Espinosa and captain Rob McNaughton put the result beyond doubt with some late majors. Best on ground went to Dane Roberts in a great tagging display that saw him run with one of the best players in the competition and save several goals with his tackling and defensive pressure. 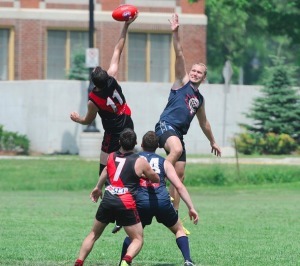 With the win, the Dingos are guaranteed to be playing in September. The final round of the regular season will decide what the finals fixture will look like, with the red and black taking on the top-of-the-table Toronto Rebels at 9am on Saturday at Humber.